There’s a new treatment in town, and it could very well help with your Keratoconus symptoms. But first, let’s talk about what Keratoconus is and how it can affect your daily activities. The cornea of the eye is usually shaped like a dome. This allows light to pass through it and hit the pupil. Keratoconus is a type of corneal ectasia, a condition that causes the cornea’s tissue to become thinner than normal, which makes the cornea into a cone-like shape. This causes light to be refracted incorrectly, resulting in blurry vision, which in turn, makes everyday activities like reading or driving difficult. A surgical procedure involving the removal of a damaged cornea, which is replaced with a healthy donor one. 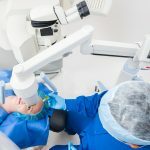 Depending on the severity of the condition, an ophthalmologist may perform a partial transplant, only replacing the unhealthy section of the cornea instead of the entire thing. An FDA-approved device designed to restore proper vision. Intacs are surgically inserted into the patient’s corneal stroma (a thick section of the cornea). They gently flatten the cornea, helping to reshape it into the correct dome-like form. In many cases, Intacs can repair the Keratoconus condition to a degree that a Corneal Transplant may be unnecessary. A procedure which involves special eye drops and an ultraviolet (UV) light, which are used to strengthen the corneal tissue. This can make the cornea flatter and prevent it from further developing into a cone shape. Scleral lenses are specialized custom contact lenses that allow patients with keratoconus to achieve their ideal vision comfortably and easily. Most people know about collagen as a material used in cosmetic surgery, like making the lips appear fuller. Just Google the word ‘collagen’ and you’ll find a plethora of celebrity before and after photos. What many people don’t know is that it’s actually a naturally-made protein developed inside the human body. Collagen can be found in the skin, muscles, and various ligaments. The cornea of the eye also contains collagen. It is made up of tiny collagen fibers that lie in an intertwined fashion, ensuring that the cornea is kept clear. As mentioned above, Collagen Cross-Linking can be used to treat Keratoconus for improved vision. The procedure is called ‘cross linking’ due to the placement of bonds in between the collagen fibers. These bonds provide support to stabilize the cornea. How Does Collagen Cross-Linking Help My Keratoconus? 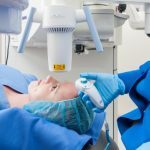 Collagen Cross-Linking, or CXL, is considered an ideal treatment for Keratoconus because the procedure flattens and strengthens the cornea, helping to reverse its misshapen form back to its correct one. Once the cornea returns to its original dome-like shape, light can once again hit the pupil correctly, allowing the individual to have improved vision. CXL is most effective in patients who have been recently diagnosed with Keratoconus. That is because the more condition advances, the more difficult it is to manage. While it does not reverse the corneal shape completely, it can slow down the Keratoconus progression. In most cases, the patient will still need some type of vision correction assistance, such as eyeglasses or contact lenses. 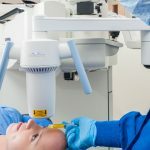 When a patient is a good candidate for Collagen Cross-Linking, an ophthalmologist will perform the minimally invasive procedure, which typically lasts between 30-60 minutes. CXL is done in the office, so there is no need for a hospital visit. First, the doctor will numb the eye, so the patient shouldn’t feel any pain during the process. Then, eye drops containing riboflavin (vitamin B2) will be administered. These drops let the cornea absorb light and prepare the eye for the UV light application. The patent sits in a reclining position and looks at the UV light for approximately 30 minutes. The UV light causes an oxygen reaction, which then causes the development of new bonds in between the collagen fibers. There are actually two types of CXL procedures. One is called Epithelium-off, and the other is called Epithelium-on. The difference between them has to do with the epithelium, also called “epi”, which is a tissue located on the outside layer of the cornea. During the Epi-off procedure, the epi is gently removed. This lets the riboflavin drops to be absorbed into the eye more efficiently. During the Epi-on procedure, the epi stays in place. It is not removed at all. However, it can take more time for absorption of the riboflavin drops. Knowing which version of the CXL treatment is right for your condition is something each patient should discuss with their ophthalmologist. Each one has benefits and risks in terms of procedure and recovery time. Talk to your doctor about which procedure is best for you. Although radiation caused by UV light can be harmful to one’s health, the amount of UV applied during the CXL procedure does not reach dangerous levels. According to The National Center for Biotechnology Information, a wavelength of 360–370 nm with an accumulated irradiance of 5.4 J/cm2 ensures that the exposure of all structures is below harmful levels. Additionally, the riboflavin eye drops that the patient receives prior to the UV light application serves as a solid wall of protection against any potential radiation effects. 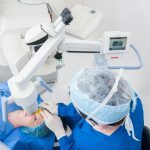 In April 2016, after conducting rigorous testing and reviewing case studies, the FDA approved the CXL procedure as an effective treatment for slowing down the progression of Keratoconus. Like any medical procedure, there are some things you should know beforehand and some preparation you will need to do. On the day of the procedure, avoid wearing any eye makeup, creams, lotions, perfume, or cologne. The ophthalmologist will perform CXL on one eye at a time and it will affect your vision in the first few hours, so make sure someone can drive you home after the procedure. Recovery time can be different for each patient, especially depending on the type of CXL chosen. For the Epi-off procedure, there may be some pain felt over a few days’ time. As the epi heals, the pain will lessen and eventually fade completely. It may take up to a week and a half to resume normal activities. If the Epi-on version was done, then recovery time tends to be quicker and virtually painless. Most eye doctors recommend not wearing contact lenses in the first few days following Collagen Cross-Linking. Others suggest waiting several weeks, but this is contingent upon the type of CXL performed on the patient. A condition where the cornea becomes cloudy, making vision clarity difficult. A person with corneal haze will experience blurriness. This side effect usually disappears on its own, but if not, steroid eye drops can be given to treat it. This is one of the most common side effects of any medical procedure. Infection can be treated with medicated eye drops or topical antibiotics. Steroid eye drops can prevent scars from forming, but if it occurs despite this, a corneal transplant may be necessary. Small wounds that appear as a gray or white color on the cornea, usually caused by inflammation. If you think you may be experiencing any of these side effects, talk to your eye doctor right away. Remember, Keratoconus is a condition that requires ongoing treatment by a qualified eye doctor. Even after Collagen Cross-Linking has been performed, it’s important that you or a loved one who suffers from this disease find an eye doctor with you are comfortable with and trust to monitor the condition for the long-term. Are you considering Collagen Cross Linking or would you like to know if it could help your Keratoconus? Speak with our corneal specialist, Dr. Richard Chu, and the team of helpful staff today.